Switching to a healthier diet and lifestyle eventually brings up this subject: What the heck am I using on my skin? Our skin is our largest organ, and it absorbs up to 70 % of what we put on. If you are careful about what you are eating, and only want cleanest ingredients, you will start to want the same for your skin. 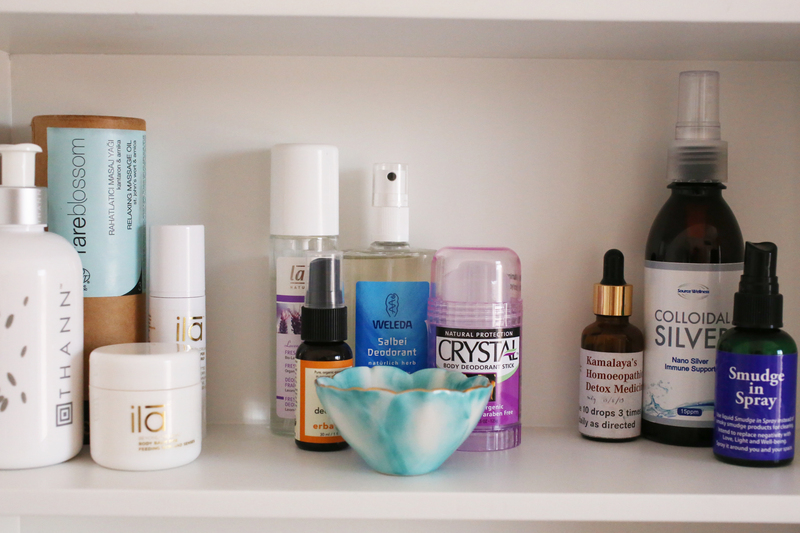 My quest for organic skin care started when I was studying in London -I realized that even if I eat organic, whole foods, my skin was very problematic and I was constantly fighting with adult acne mostly on my chin area. After switching on to a clearer diet and products, it is definitely much better now. 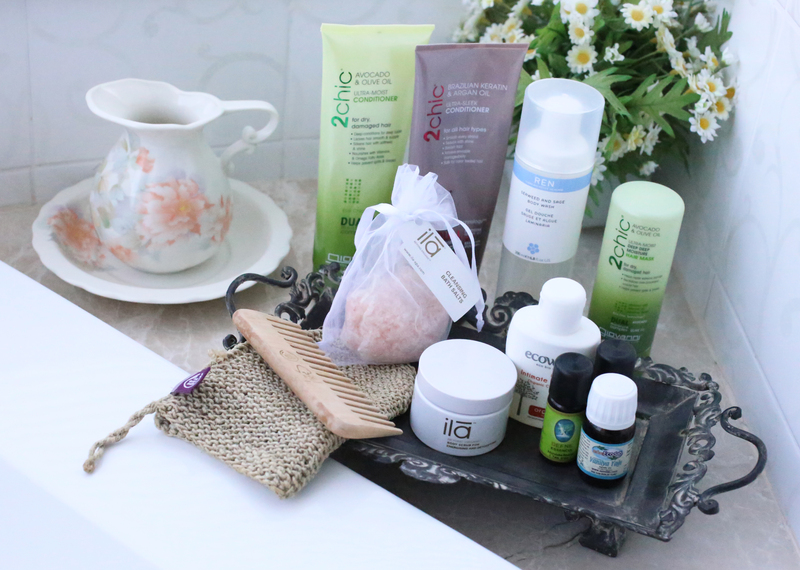 Most people are sceptical about organic skin care, questioning if they really work. After years of experience, I can say they work brilliantly. 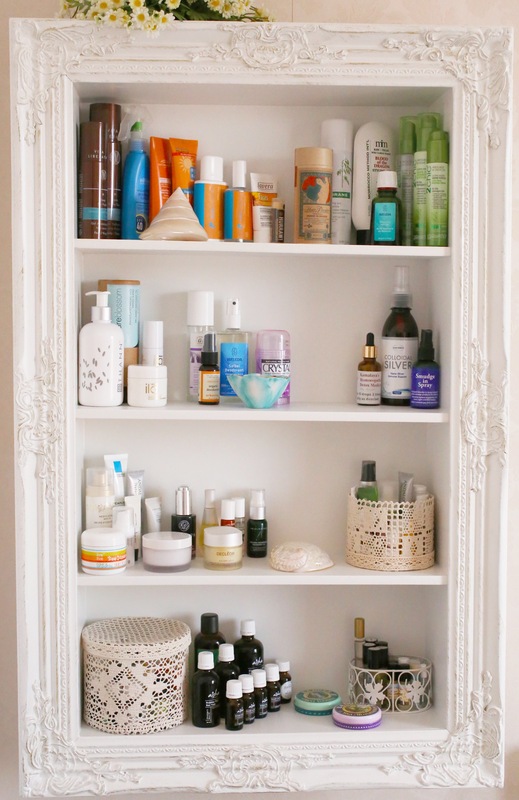 Here, you will see my organic skin care favorites, although I cheat sometimes (see the Chanel perfumes above). I have a oily/combination and problematic skin (mostly on the chin area) so these may not work for everyone, however you will see that most of the products I have can be used by every skin type. I have classic routine: I first take my makeup off by using Bioderma Sensibio Micellar Water and cleanse my face with Dead Sea Spa Magik Gentle Cleansing Facial Wash. If I use waterproof mascara, Living Nature Gentle Eye Makeup Remover will take it off effortlessly. I really like toners, my favorite ones are Dr. Hauschka Facial Toner, Aubrey Organics Pure Aloe Vera and Aisha Lavender Infused Mist. Exfoliation is a really important part of my skincare routine. I make sure I exfoliate my face daily, either using Clarisonic Mia, Jurlique Fruit Enzyme Exfoliator or Dermalogica Gentle Cream Exfoliant. My favorite mask is Pangea Organics Facial Mask which has matcha with goji and açai berry listed in ingredients. Dr. Hauschka Clay Mask and GlamGlow YouthMud are recent finds that I also find that works well with my skin. I have dry and damaged hair due to my teenager and college years -I was constantly changing my hair color (I was a redhead!) and all these years really damaged my hair a big deal. I have been natural for almost two years- no more dying, but I do straighten my hair because I have curly/wavy hair that is also very frizzy. I tried many brands but organic shampoo-conditioner is one big challenge to me, I couldn’t find any that works well on my hair type. Until I met Giovanni– an ecological hair care brand. Their Avocado & Olive Oil and Brazilian Keratin & Argan Oil lines works great with my hair. Other products I use in bath are: Ren Seaweed and Sage Body Wash and Ecowell Intimate Wash, both great products and don’t contain any artificial perfumes. Body Scrub by ila is another favorite, I like to use it with Hemp Mitt from The Body Shop. Once or twice a week, I try to do a 20 min. hot bath with Himalayan or Epsom salts, green clay and essential oils. I find it really relaxing and detoxifying for the body. Foam baths are one of the worst things you can do to your body -most foam bath products have detergents (That is how they foam!). They strip natural oils from the body, and can be in your bloodstream in minutes! So try to use natural things for bath -it may not look fancy, but you will definitely feel much better. Most people don’t take the toothpaste seriously – to me, it was one of the most important switches in my bathroom products. One of the greatest absorptions takes place under the tongue (that is why there are so many sublingual pills at the market), so imagine what your body absorbs from your toothpaste -you guessed right, toxic chemicals again. Here are two really good and natural toothpastes that also helps you with bad breath: Dentiste’ Whiter Fresh Hygienic & Therapeutic Toothpaste and Dr. Hauschka Fortifying Mint Toothpaste. 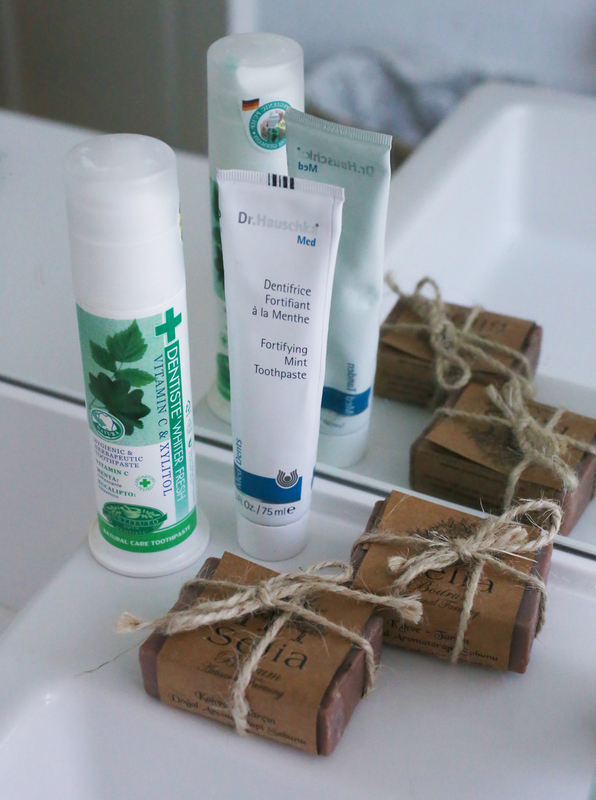 Make sure you use a toxic-free soap as well, here I try to use local soaps- Bodrum is a natural soap heaven. 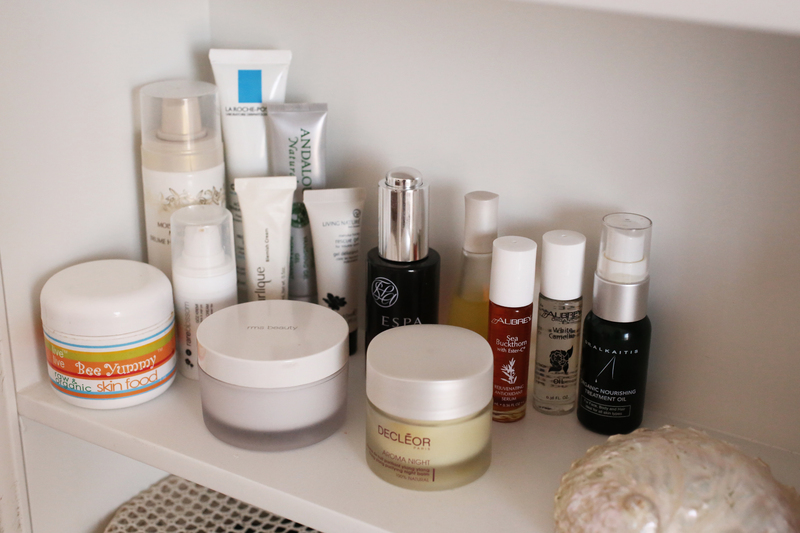 Moisturizers and serums are a big part of my routine. Even if I have oily skin, I prefer oil based moisturizers. I find them more hydrating, therefore my skin does not get oily during the day. Just make sure you use only a small amount! The best cream I used so far is Raw Organic Bee Yummy Skin Food by Live Live. It has bee products like honey, bee pollen, propolis, royal jelly and additionally St. John’s Wort oil. Very light and hydrating, I mostly use it in the morning for a good makeup base. RMS Beauty Organic Coconut Oil is another favorite, I can say it is quite expensive but the best quality coconut oil I could ever find. You can use coconut oil as a makeup remover and face-body and hair moisturizer, it is truly a multi purpose product. Decléor Aroma Night Baume de Nuit Purifiant Ylang Ylang is a moisturizer I use at night when I feel like my skin is very dehydrated due to weather changes. It works great but a bit heavy so I use a little bit and occasionally. This is not a organic product but has all-natural ingredients. Onto the serums. I really like them as I feel they are absorbed immediately by skin, they are great for summer. My most beloved one is Dr. Alkaitis Organic Nourishing Treatment Oil. I can say this is the product makes my skin glow like nothing else. You can use it for your body and hair too. My brother brought this ESPA Optimal Skin ProSerum from London. This is a relatively new spa brand, but I am sure they will be very popular soon. This particular serum has a combination of natural essential oils and works like magic if you want hydrated, glowing skin. Decléor Aromessence Ylang Ylang Sérum Purifiant is another favorite if I feel particularly oily that day. 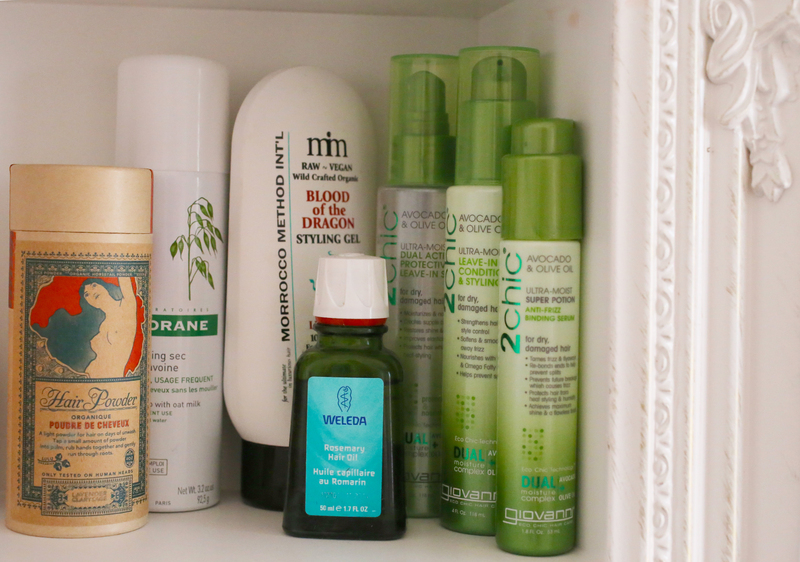 It really keeps oil and acne at bay. Sea Buckthorn with Ester-C Rejuvenating Antioxidant Serum and White Camellia Oil by Aubrey Organics are my anti-aging serums that use mostly on my expression lines. I really like this comparingly cheap but effective brand. La Roche Posay Cicaplast is not organic nor has a natural label, I use it only for my acne scars if I have any, really heals the scars like nothing else. It basically covers the scar and helps it heal itself very, very quickly. This is a product most people use after cosmetic peels. Rare Blossom Organic Rhodiola & Green Tea Eye Cream is what I use around my eye area. I don’t use it everyday (probably I should), only when I feel particularly dry. This is a Turkish organic brand which unfortunately, is no more available. I have to find something else soon. Living Nature Manuka Honey Rescue Gel and Andalou Naturals Blemish Vanishing Gel are what I use on my acne. They work amazingly well. Jurlique Blemish Cream is a tinted cream, I use it on my chin area in the morning if I don’t want to put makeup on. For body, Thann Jasmine Blossom Rice Extract Body Milk is what use after shower. It is light and hydrating, great for summer. Rare Blossom St. John’s Wort & Arnica Oil is actually a massage oil, I use it at night sometimes to give myself a relaxing reflexology massage. Body Oil for Vital Energy and Body Balm for Feeding Skin and Senses by ila are my go-to products when I particularly feel dry especially during winter. It is great to use them both on knees, elbows and heels. Deodorants are extremely important to me. I know that most deodorants you find on the market are full of toxic chemicals, perfumes and heavy metals such as aluminum. Remember your body has a natural detox system, that is our lymphatic system. We as humans are designed to perspire, and by using such products, you actually block your lymphatic system. According to latest researches using toxic deodorants will increase the risk of getting breast cancer- very easy to understand why. We should seek out for natural alternatives which also prevents the odor by fighting with bad bacteria. My four favorites are: Weleda Sage Deodorant, Lavera Fresh Deodorant Spray (Organic Lavender & Aloe Vera), Erbaviva Lemon & Sage Deodorant and Crystal Body Deodorant Stick. I like them all -they don’t prevent sweat but definitely make you feel fresh and keep you odor-free all day long. Colloidal Silver by Source Wellness is truly amazing, multi functional product: You can use it for skin infections, wounds, cuts, burns, insect bites, acne, inflammation, sunburn and similar conditions. Smudge in Spray by The Crystal Garden is another gem I found in Whole Foods store. It is made from herb infused spring water, coming from sacred sites around the world including Mother Mary’s home in Anatolia, Turkey. I spray it around me sometimes when I meditate or pray. 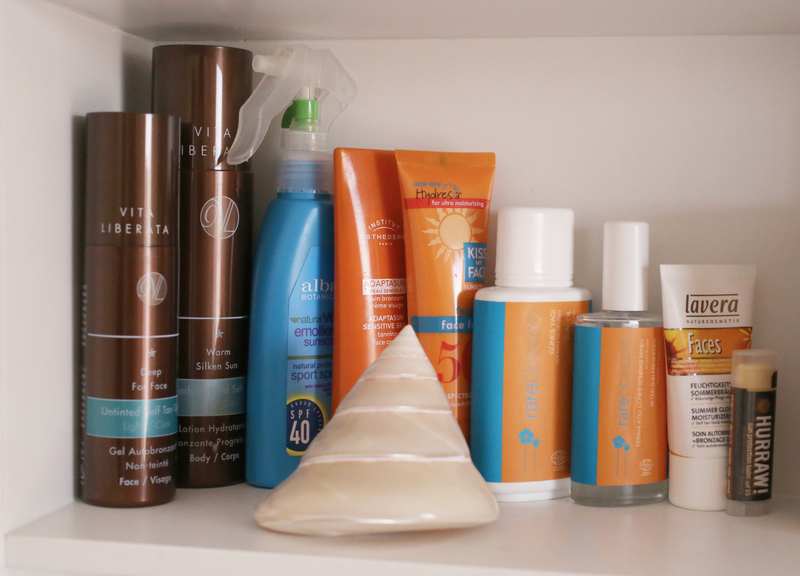 For a subtle glow, I use Vita Liberata‘s Untinted Self Tan Gel for Face and Body. Lavera Summer Glow Facial Moisturizer also a great alternative to keep the summer tan longer, it gives you some color without streaks. They are the only autobronzers I could find that is organic, and I am very happy with them -because they are untinted and won’t cause streaks, they are great to use on very pale skin like mine. My pale skin requests a good protection from the sun- I live in Bodrum where we see 45 °C very easily during summer. Alba Botanica SPF 40 Natural Protection Sport Spray is what I use on my body. It is very emollient and really the best natural sunscreen I could find. For my face I use Kiss My Face SPF 50 Face Factor. If I want to get tan a little bit, I sometimes use Institut Esthederm Adaptasun Sensitive Skin Tanning Face Cream (Normal to Strong Sun). It is not exactly natural but I find it helps your skin get tanned while protecting it. In case I got any sunburn (which happens very, very rarely) I use Rare Blossom After Sun Refreshener, works like magic. Your lips also need protection- Hurraw! SPF 15 Lip Balm is an amazing product. I actually own couple flavors of Hurraw! brand, it is the best organic, raw lip balm in the market. For hair, again I really like Giovanni‘s 2chic Avocado & Olive Oil line. I also like to use organic & raw Blood of the Dragon Styling Gel by Morocco Method Int’l for a beachy hair- I mostly use it after I swim. Weleda Rosemary Hair Oil is another product I use as a part of the hair mask. (I will give you a recipe soon.) Hair powders are my life-savers; because I have curly hair and the water here is extremely harsh, I cannot wash my hair everyday -it goes crazy. So hair powders keep me fresh during these days. Lulu Organics does the best hair powder that also smells great. 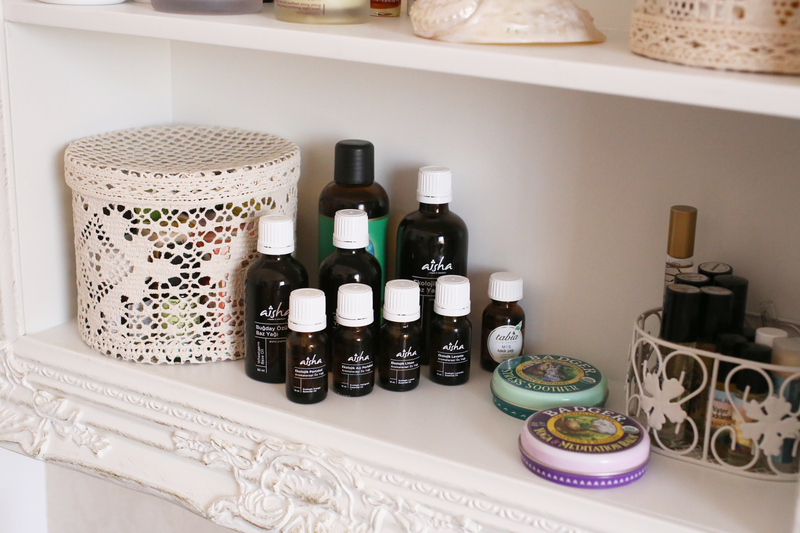 I have a very big selection of essential oils -I really believe in them. You can actually make your own skin care with these magical oils. I will be writing about aromatherapy and giving you natural skin care recipes soon. There are lots of good brands, but to support local brands, my choices are Aisha and Tabia which are quite high quality. For the perfumes, I actually cheat in this part. 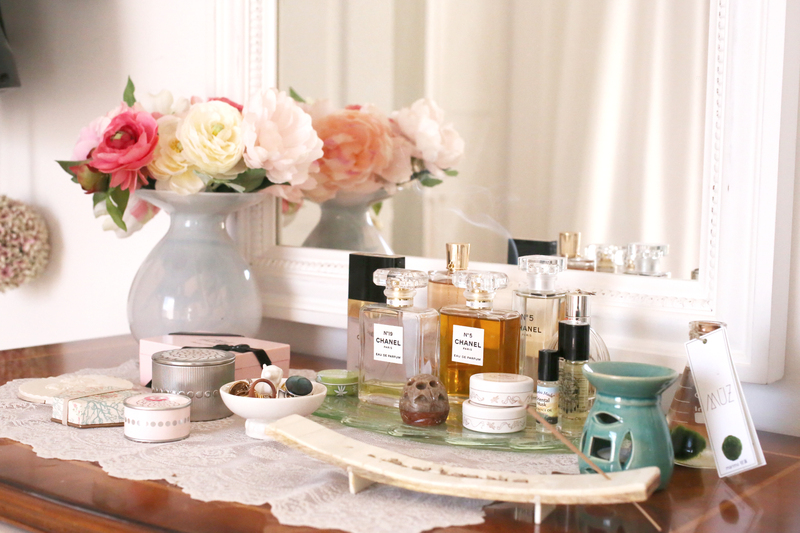 I have so many toxic perfumes -but I make sure I don’t wear them on my skin. I spray onto my hair and clothes. The only perfumes I use on my skin are the natural ones – Auric Blends and Kuumba Made make the most beautiful natural fragrances. I also like Badger Organic Balms -they have a great selection. Meditation Balm and Stress Soother are my favorites. 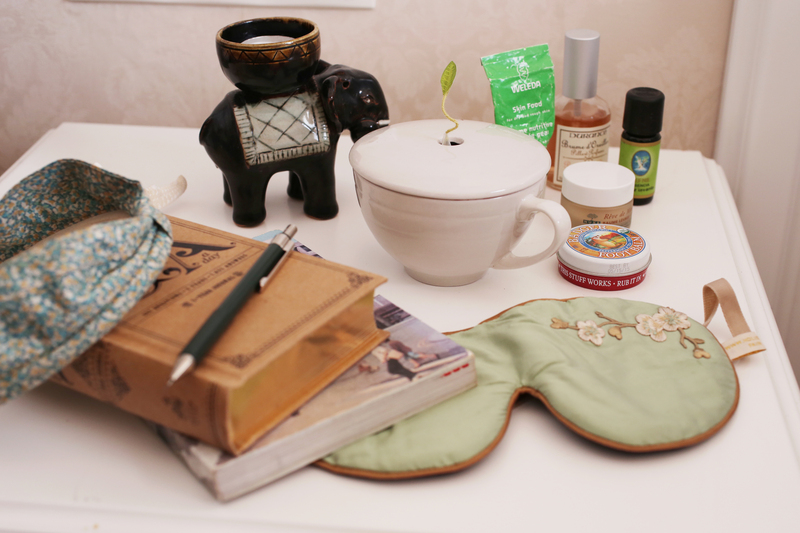 I have few life-saver products on my bedside; Weleda Skin Food which saves my hands every night, Badger Organic Foot Balm, Nuxe Rêve de Miel Lip Balm which saves my lips by when they are chapped, lavender pouch sleeping mask by Holistic Silk and Durance Pillow Mist. 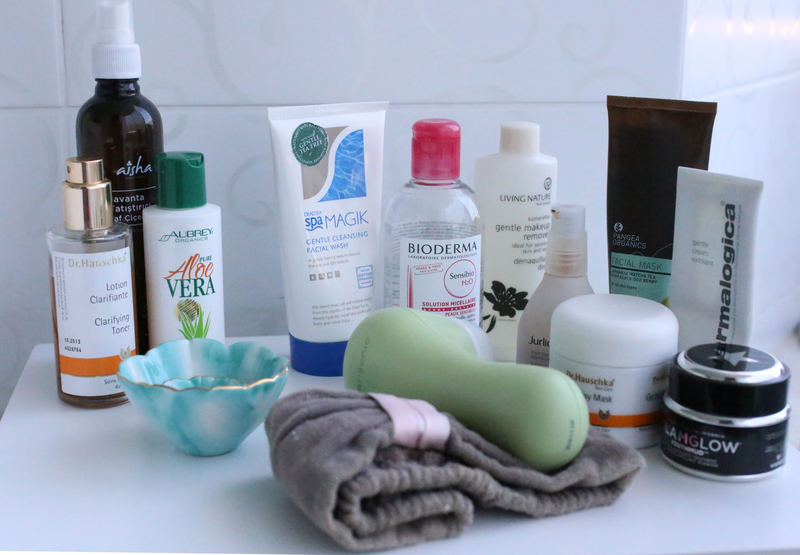 It is been a very long post, if you are still reading, we have a beauty junkie 🙂 I would like your opinion on natural beauty finds: What do you like? What are your recent finds? Please share! Happy Holidays and New Year’s Eve! I¡¦m not certain the place you’re getting your information, however good topic. I needs to spend a while learning more or figuring out more. Thanks for magnificent info I used to be in search of this information for my mission. Çok güzel ve faydalı bir yazı. 2016’da yeni önereceğiniz ürün ve markalar hangileri? Mutlaka güncelleyeceğim bu bilgileri. Yeni favoriler oluştu aslında, bir toparlayıp yazısını hazırlayabilirim umarım en kısa zamanda. Çok teşekkürler!